Nothing to do with Star Trek (and you’re not original for thinking of it). It stands for “Sporting Courses” – basically not your usual duel carrigeway so beloved of testers up and down the country, but something a little hillier, twisty-turnier, more countryside-y. Nicer, to my mind. Dave H asked me to enter a few as Horwich had done really well last year in the “Lakes and Lancs” SpoCo series last year and wanted to do so again. I’d just finished ‘cross season and wasn’t quite ready to slack off so, given that I could get enough races in by March, I agreed to give them a go. Not take them deadly seriously, but show up and see what happens. The first round was a loop I knew really well, out in Bowland. I didn’t bother doing any prep for it, in fact I went for a really nice ride over all the nearby big hills beforehand and just about turned up in time. I’d not done anything to the road bike to make it more suitable for time trialling, in fact I’d completely forgotten to even fit the aero bars, so I looked slightly out of place in amongst the sea of wind cheating frames and pointy helmets but it didn’t seem to matter. I finished somewhere in the middle of the results sheet, shugged my shoulders and went home content. The next round I’d entered was cancelled due to to awful winter we were still in the middle of. So was the round after that. Suddenly I was struggling to find enough events to do to get a place in the league. My plan to be finished by March was out of the window and my season would have to be dragged out until June. Bugger. This time I remembered to fit the aero bars and actually did a bit of a proper warm up before (rather than a huge ride). It seemed to work as, although one of the aero bars came loose halfway round (which was quite exciting trying to stay tucked in at 50mph with one arm flaping around trying to keep everything in place…), I finished in the top 5. Happy days. Round 3 (for me) was the longer Circuit of the Dales (another one so established it’s got it’s own name). 50 miles this time, heading from Ingleton towards Kirkby Lonsdale, Sedburgh, Hawes and past the Ribblehead viaduct. Nice. Not a duel carriageway in sight, just miles of gorgeous hills and Dales (obviously). The fairly flat/steady first 30 odd miles would, I figured, by much faster with all the proper kit, but the section from Hawes to Ribblehead would play into my hands – all uphill at a point where many would be tiring. Lets have it! I was stunned at just how much of a difference TT kit made on the easier descents – riders I’d made minutes up on would fly back past me as I topped out, speedwise, ebfore I reeled then back on any inclines, but I kept to my “plan” and saved a little for the final 10 miles or so. Again it seemed to work out alright as I finished 12th, this time with a loose saddle that was pointing so nose down I couldn’t actually sit on it for the final 20 miles! Round 4 was as close to a “real” TT as I wanted to get. It came the week after the Dirty Reiver and I was in no way recovered from that effort. Flat, straight duel carriageway for almost the whole thing wouldn’t suit me on the best of days and this really wasn’t the best of days. I had no power, couldn’t get comfy and spent the whole 30 miles watching the cars whizz past, wishing I was going wherever they were. Skinsuited people on wind cheating bikes slipped and skimmed past me over and over as I lumbered round, baggy jersey flapping round like a parachute. Just awful. My finishing place wasn’t anything worse than mid pack, but it was a low point for me in the series. Thankfully the next round was much more my cup of tea. A hill climb with a twist – it being 8 (AND A BIT) miles long. Oh yes! Once again, the advantage the testers had with their specific bikes and clothes was reduced by the lower speeds and, although I hadn’t done any sort of homework on where the course went, I shot off from the start line in determined mood. All I knew was that it was about 8 miles, so I gave it the beans until 8 miles popped up on the Garmin and looked up to see…nothing. No finish line, just more hill. Drat. When the finish line finally did pop into view about half a mile later, I’d slowed a bit. Didn’t matter though, I’d still got my best finish, in 2nd. I celebrated with a ride in the sunshine over The Struggle and Kirkstone Pass. Nice. Wan’t sure what to expect from the next round (for me), up in Cumbria, but a route recce the day before (I still maintain I wasn’t taking it seriously, but warnings in capital letters, in bold, underlined, on the race information leaflet convinced me I should have a gander before race day…) revealed a lovely loop with a bit of everything – views, flat bits (yuck, thankfully few of these! ), climbs of all types (long and steady, short and steep, horrible and really horrible etc). Fun! Under blazing sun I rode the course with a big grin on my face. It was lovely, even the horrible 20% climbs right near the end. Another 2nd place. Ace. 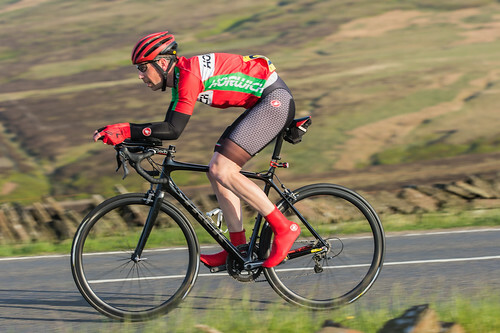 With only 2 races left in order to qualify for the league, the evening race near Saddleworth promised much – mainly because it was called a “Mountain time trial”. I hoped this would mean ups and downs rather than a flat route in between the hills. It did. It really did. To the point that I completely misjudged how long it would take to get to the start line from where I’d parked – the start being part of the way up the first hill. I barely made it, arriving to see my minute man about 20 seconds up the road. With my heart still bouncing around at about 170bpm I realised I hadn’t tightened my shoes up “10 seconds” – could I reach down and turn the BOA dials underneath the shoecovers in time? “5, 4, 3…” No chance. Off I sprinted, feet moving all over the place for the first minute or two as I looked for a flatter section to ease off and do them up. 5 minutes later there still hadn’t been one! I probably lost big chunks of time not knowing the corners on the descents, but wasn’t too bothered about it – I knew I’d have no time to recce the route so just had to accept it. I did get properly wound up on the final descent which should have been 45 – 50mph easily but about a third of the way down I got stuck behind a plodding lorry, content to sit at about 20. Gah! Final round! Back in Bowland, fittingly, just down the road from the first round, on a route I’d ridden many times before in road races. It felt weird not riding round not in a peloton, but I had fun pretending I was in a lone break (albeit a slow moving one…). 5th place. Okconsidering TT bits and bobs would have helped. And that was that. Without really realising, I ended up 3rd overall (I’d been looking at the overall results, rather than the SpoCo riders only ones, so it was a bit of a surprise!) and Horwich finished in 2nd in the club table. Ace! Reckon I’ll be back next year for ore of the same.